Carrie Holmberg is a lecturer and preservice teacher educator at San José State University. She taught at a Title I comprehensive high school in Silicon Valley for nearly a decade and has extensive experience mentoring new teachers. A National Board–certified teacher and Bay Area Writing Project teacher consultant, Holmberg earned a bachelor of arts in English from Stanford University and a master of arts in education from the Stanford Teacher Education Program. In addition to supervising teacher candidates, coauthoring articles, and writing a book, she is pursuing her doctorate at San José State University in the Educational Leadership program. Holmberg is committed to researching, developing, and celebrating educators’ knowledge, skills, and professionalism. She is an enthusiastic ambassador for teachers, educational leaders, and the people and systems that support them. Holmberg lives in Silicon Valley with her family. 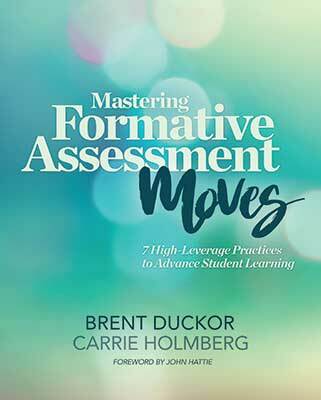 Learn how to gauge student learning and adapt instructional decisions on the fly with seven research-based, highly effective formative assessment moves.